For a limited time, the GHS Booster's club has partnered with Nightmare Graphics to offer GHS 'choose your your sport' Spiritwear embroidered with your favorite GHS sport in the logo. Orders must be placed on or before December 12, for Holiday delivery. After picking out your size and color, go to the bottom of the order page, click 'Glenelg High School' and choose the sport you want to represent on your logo. All GHS sports are included. Feel warm and comfortable in 60/40 cotton/polyester pullover hood featuring a pouch front and sport paneled shoulder for maximum movement. This 9.5 oz sweatshirt will be comfortable and stylish for any occasion with spandex reinforced rib knit cuffs and waistband, and a headset opening inside pocket. This sweatshirt features your school logo and favorite sport beautifully embroidered on the left chest. Available in black, red, pink and heather gray. Adult sizes x-small to 4xl, youth sizes small to large. Perfect for wearing to the game or just lounging around the house, these open bottom sweatpants are made from 60/40 cotton/polyester blend. At 9.5 oz. these sweatpants feature a two deep side pockets, an inside drawcord and covered elastic waistband for maximum comfort. These sweatpants feature your school logo and favorite sport beautifully embroidered on the left thigh. Available in black, red, and heather gray. Adult sizes x-small to 3xl. Show off your school colors in this Varsity Hooded Sweatshirt. Not your everyday sweatshirt with contrast ribbed trim and two ply hood with contrast liner and drawcords. Made from rungspun a 60%cotton/40% polyester blend is sure to keep you warm at 9.5 oz in weight. Best of all there are three pockets and a headset opening inside. This sweatshirt features your school logo and favorite sport beautifully embroidered on the left chest. Available in black with red accents. Adult sizes x-small to 4xl. This ColdGear jacket will keep you warm without the bulk and weight of a traditional warm-up jacket. 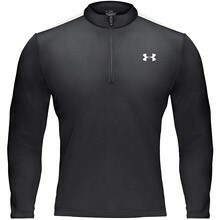 It will keep you warm, dry and comfortable during a workout or watching a game. This jacket features your school logo and favorite sport beautifully embroidered on the right chest. Available in black, red, and graphite. Adult sizes x-small to 3xl. Click here for all GHS Sports Spiritwear Items. Show your school spirit in this preshrunk 100% cotton short sleeve t-shirt. This 6.1 oz shirt features a tapered neck and shoulders for maximum fit and comfort. The shirt features your school logo and favorite sport beautifully embroidered on the left chest. Available in red, black, sport gray, and pink. Adult sizes small to 2xl and youth sizes small to large. $11.50.